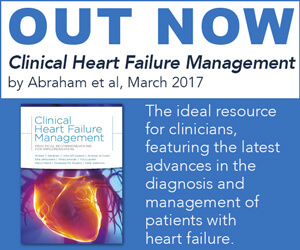 Acute Heart Failure (AHF) is a “multi-event disease” and hospitalisation is a critical event in the clinical course of HF. Despite relatively rapid relief of symptoms, hospitalisation for AHF is followed by an increased risk of death and re-hospitalisation. In AHF, risk stratification from clinically available data is increasingly important in evaluating long-term prognosis. From the perspective of patients, information on the risk of mortality and re-hospitalisation would be helpful in providing patients with insight into their disease. From the perspective of care providers, it may facilitate management decisions, such as who needs to be admitted and to what level of care (i.e. floor, step-down, ICU). Furthermore, risk-stratification may help identify patients who need to be evaluated for advanced HF therapies (i.e. left-ventricle assistance device or transplant or palliative care), and patients who need early a post-discharge follow-up plan. Finally, risk stratification will allow for more robust efforts to identify among risk markers the true targets for therapies that may direct treatment strategies to selected high-risk patients. Further clinical research will be needed to evaluate if appropriate risk stratification of patients could improve clinical outcome and resources allocation. SPC received research support from NIH, ANRQ, PCORI, AHA, Novartis Consulting: Novartis, Trevena. All other authors have no conflicts of interest to declare. Ovidiu Chioncel, Carol Davila University of Medicine and Pharmacy, Emergency Institute for Cardiovascular Diseases “Prof. C.C. Iliescu”, Bucharest 950474, Romania. E: ochioncel@yahoo.co.uk. *Mihai Gheorghiade passed away on 24 August 2017. Post-hoc analyses of these clinical trials and international registries have identified several prognostic factors in AHF patients and have attempted to explore their relationship with post-discharge mortality. Knowledge of mortality predictors can be used to generate predictive models that can aid clinicians in their decision-making, in particular by identifying patients who are at high or low risk of death. These models could be used as a framework to discuss prognosis and provide evidence to support rational decision-making. Even if the phenotypic heterogeneity of AHF patients5 makes it difficult to find a risk model suitable for all patients, many parameters are common to several of the models. 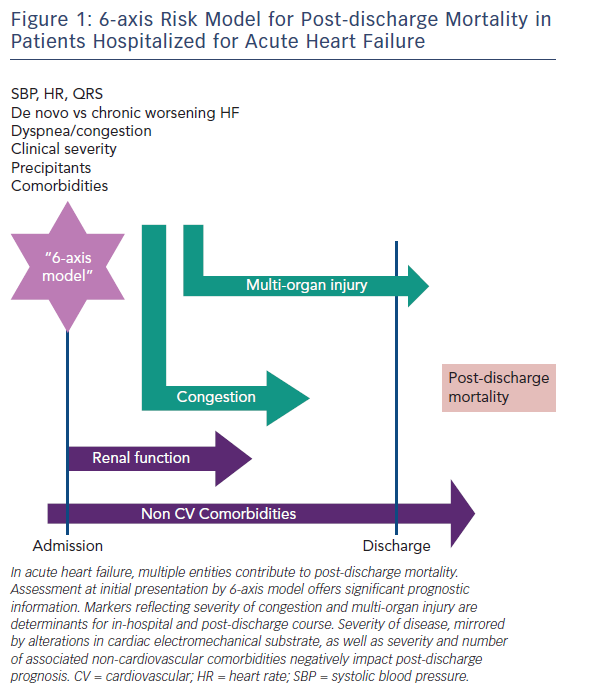 Demographic characteristics, renal function, markers of organ injury, and non-cardiac comorbidities are included in most risk models (see Figure 1). Our goal in the present paper is to review the most important prediction models developed for the risk-stratification of patients with AHF. Heart failure hospitalisation represents an important opportunity to assess patient prognosis. In the care of patients with HF, estimating and communicating prognosis is recommended by clinical guidelines6 and is considered to be an important component of high-quality health care. A better understanding of the mechanisms underlying the poor prognosis of patients hospitalised for HF may help provide better care and improve post-discharge mortality. One of the major goals of AHF risk stratification is to match the risk profile of the patient with the type and intensity of care. AHF is not one distinct pathophysiologic entity, but rather a heterogeneous syndrome with multiple contributors to the progression of the disease and prognosis. A comprehensive assessment in these patients is necessary to identify multiple prognostic characteristics that may become possible therapeutic targets. Moreover, the phenotypic heterogeneity of AHF patients, either at presentation or during the hospital course, suggests that an algorithm is needed to classify these patients. For initial presentation, a “6-axis model” has been proposed to classify AHF patients.7 While this was designed for the initial assessment, each component of this model has long-term prognostic value (see Figure 1). Candidate predictors can be obtained from patient demographics, clinical history, physical examination, disease characteristics, laboratory tests, and previous treatment. Studied predictors should be clearly defined, standardised, and reproducible to enhance generalisability and application of study results to practice.8 Prognostic studies use a multivariable approach in their design and analysis to determine the important predictors of the studied outcomes and to provide outcome probabilities for different combinations of predictors. The aim is to determine whether an outcome can reliably be attributed to a particular risk factor, with adjustment for other causal factors (confounders) using a multivariable approach. Predictors can be derived from registries (see Table 1) or from randomised clinical trials (RCTs) (see Table 2). Clinical characteristics of patients enrolled in RCTs may differ to those in the general population with HF, and prognostic models obtained from RCT data may have restricted generalisability because of strict eligibility criteria for the trial, low recruitment levels, lower rate of associated comorbidities, or large numbers of patients refusing consent. Registries have increased predictive power due to the large number of patients enrolled, but collection of clinical variables may not be as rigorous and complete as in RCTs. One important consideration when assessing predictors of post-discharge mortality is the time frame of data collection.22 Variables collected upon admission may be less likely to be linked to 6-month or 1-year prognosis, as changes in clinical status or medical interventions performed during hospitalisation may affect medium or long-term outcomes. However, some variables collected at AHF admission are unmodifiable risk factors, such as age, gender and presence of comorbidities. In addition, when considering all prognostic factors, it is important to carefully review the selection criteria for the cohort from which the predictor was reported. For example, some RCT enrolled patients with reduced ejection fraction (EF), while other RCTs were inclusive AHF irrespective of EF. 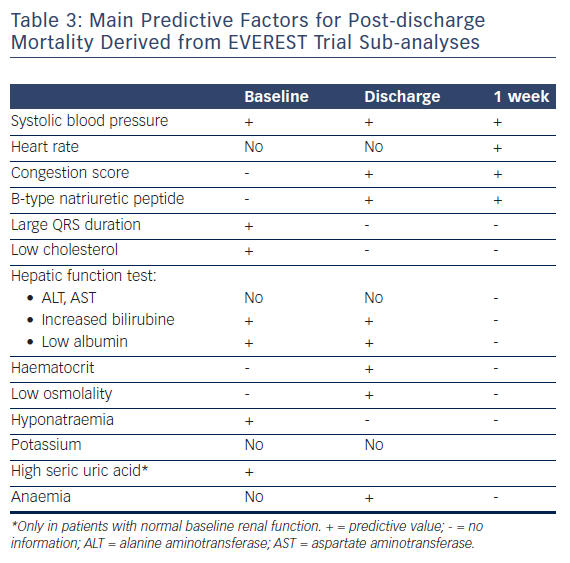 Among patients with reduced EF, the Efficacy of Vasopressin Antagonism in Heart Failure: Outcome Study with Tolvaptan (EVEREST) trial database23 allowed the opportunity for numerous sub-analyses which have provided valuable insights in understanding post-discharge mortality predictors (see Table 3). In RCTs and registries, the predictive factors for post-discharge mortality included age, history of previous hospitalisation, congestion, systolic blood pressure (SBP), heart rate (HR), QRS duration, renal function, markers of organ injury, and non-cardiac comorbidities (such as diabetes, cerebrovascular disease, chronic obstructive pulmonary disease, liver cirrhosis, and anaemia) (see Tables 1 –3). Although, there are many candidates that have additional prognostic value, the key variables are SBP and renal function. These two are the best discriminators between patients who survive hospitalisation and those who die or are readmitted post-discharge. We have highlighted some of these important prognostic markers that are relevant in clinical practice. Natriuretic peptides (NPs) represent a sensitive and noninvasive measure of ventricular filling pressures, which correlates with overall cardiac function and informs prognosis, irrespective of ejection fraction.28 During hospitalisation and the post-discharge period, persistence of elevated levels of NPs after resolution of clinical congestion signifies haemodynamic congestion. In the ESC-HF-LT registry,41 hyponatremia (serum sodium <135 mEq/l) has been reported on admission at 25 % of patients and at discharge at 18 % of patients. Although Tolvaptan was successful in reducing hyponatremia and increasing serum osmolality, inducing weight and fluid loss, it has not been shown to improve clinical outcomes.23 This suggests that hyponatremia and serum osmolality, despite of markers of prognosis, are not targets for drug therapy. The majority of registries and RCTs considered baseline renal impairment as a predictor of poor outcome in AHF.47 Markers of renal function included serum creatinine, BUN, and uric acid. Injury or end-organ dysfunction, including myocardial damage, worsening renal function, and hepatic impairment, have been independently associated with mortality in AHF. Although many other organs (e.g. brain, lung, intestine, endothelium, vasculature) are exposed to injury during AHF episodes, organ-specific injury markers for these organs suitable for clinical practice are missing.51 While data support such markers as prognostic, clinical trial efforts to date with therapies designed to abort end-organ injury during episodes of AHF have been disappointing. In the ESC-HF-LT-registry,14 a number of non-cardiac comorbidities, including hepatic or renal dysfunction, previous stroke, diabetes and chronic obstructive pulmonary disease (COPD), were found to be independent predictors for 1-year mortality in patients hospitalised for HF with both preserved and reduced EF. In EVEREST, anaemia at discharge, but not admission, was independently associated with increased all-cause mortality.75 However, it is unclear whether anaemia is truly a prognostic marker or a mediator of risk. It has been postulated that anaemia is a marker of disease severity for HF, or that other factors associated with anaemia are responsible for the increased events. Multiple RCTs have investigated the impact of anaemia treatment on mortality, including the recent RED-HF trial,76 but have failed to demonstrate significant benefit. Since the aetiology of anaemia in AHF is multifactorial, targeting anaemia in the broad population with AHF may not be a viable strategy until there is an improved understanding of how anaemia or different components of anaemia directly affect post-discharge outcomes. Given the complexity and heterogeneity of AHF, prior attempts for risk modelling have not been easily adapted to clinical practice and generally have not had high discriminatory capacity. Most models were derived from demographic, clinical and biological data collected at admission (see Table 4) and only a few have used discharge data. Also, including a variable in a risk model will be negatively impacted by the quantity of missing data, and the rate of collection has varied among registries. Also, the current available models do not include the use of devices, which may carry a strong impact on prognosis in the long term.78 Actually, risk stratification by scoring methods remains only informative in the clinical decision-making process. 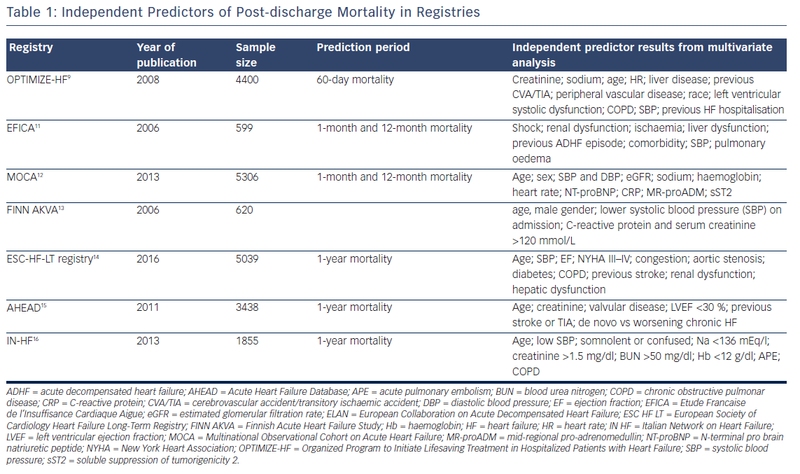 Despite numerous clinical and biological variables showing in registries and RCTs independent predictive value for post-discharge mortality, very few represent true targets for in-hospital therapies such as congestion, QRS duration, and non-cardiac comorbidities. In addition, heart rate measured at 1-week and 1-month post-discharge could be considered a target for If antagonist Ivabradine. Although in the RELAX-AHF I trial markers of organ injury were associated with 180 days mortality and decreased as result of Serelaxin treatment, the RELAX II study did not confirm these beneficial effects. Another major limitation of prognostic models in AHF is the absence of prospective validation and lack of the impact studies. Furthermore, studies to evaluate the effect of using a prognostic model on current medical practice and on patient outcome would be informative and could lead to clinical implementation of such a model.79 An impact analysis can determine whether use of the model is better than usual care.80 This remains an unmet need. In AHF, the attempts to develop risk models are justified by the evidence that the risk of post-discharge mortality and rehospitalisation remains high. Furthermore, developing risk models would aid in targeting limiting resources to the appropriate patients. Even if the phenotypic heterogeneity of AHF patients makes it difficult to find a risk model suitable for all patients, some parameters recur in many models. However, in spite of limitations, prognostic models add to our understanding of the determinants of the course and outcome of patients with AHF. The impact of stratification of AHF patients on current clinical practice should be further evaluated in prospective studies. All of the authors acknowledge the important contribution of Professor Mihai Gheorghiade in this manuscript, which represents only one of his hundreds of research contributions. Mihai Gheorghiade was one of the most respected, quoted and liked cardiologists. Committed to excellence from early on in his career he was determined to excel in patient care, research and teaching. He felt that his highest calling was to mentor students, trainees, and junior colleagues. He was never more enthusiastic than when supporting new collaborations to take place between great minds in different countries. He passed away on 24 August 2017. The world of cardiology has lost an iconic figure, but his legacy of challenging concepts will live on for many years to come. Gheorghiade M, Shah AN, Vaduganathan M, et al. Recognizing hospitalized heart failure as an entity and developing new therapies to improve outcomes: academics’, clinicians’, industry’s, regulators’, and payers’ perspectives. Heart Fail Clin 2013;9:285–90. Gheorghiade M, Peterson ED. Improving postdischarge outcomes in patients hospitalized for acute heart failure syndromes. JAMA 2011;305:2456–7. Butler J, Fonarow GC, Gheorghiade M. Need for increased awareness and evidence-based therapies for patients hospitalized for heart failure. JAMA 2013;310:2035–6. Ambrosy A, Fonarow GC, Butler J, et al. The global health and economic burden of hospitalizations for heart failure: lessons learned from hospitalized heart failure registries. J Am Coll Cardiol 2014;63:1123–33. Ambrosy A, Gheorghiade M. Clinical profiles in acute heart failure: one size fits all or not at all? Eur J Heart Fail 2017;19:1255–7. Ponikowski P, Voors AA, Anker SD, et al. 2016 ESC Guidelines for the diagnosis and treatment of acute and chronic heart failure: The Task Force for the diagnosis and treatment of acute and chronic heart failure of the European Society of Cardiology (ESC). Developed with the special contribution of the Heart Failure Association (HFA) of the ESC. Eur J Heart Fail 2016;18:891–975. Gheorghiade M, Braunwald E. A proposed model for initial assessment and management of acute heart failure syndromes. JAMA 2011;305:1702–3. Moons MG, Royston P, Vergouwe Y, et al. Prognosis and prognostic research: what, why, and how? BMJ 2009;338: b375. O’Connor CM, Abraham WT, Albert NM, et al. Predictors of mortality after discharge in patients hospitalized with heart failure: an analysis from the Organized Program to Initiate Lifesaving Treatment in Hospitalized Patients with Heart Failure (OPTIMIZE-HF). Am Heart J 2008;156:662–73. Salah K, Kok WE, Eurlings LW, et al. A novel discharge risk model for patients hospitalised for acute decompensated heart failure incorporating N-terminal pro-B-type natriuretic peptide levels: a European coLlaboration on Acute decompeNsated Heart Failure: ELAN-HF Score. Heart 2014;100:115–125. Zannad F, Mebazaa A, Juilliere Y, et al. Clinical profile, contemporary management and one-year mortality in patients with severe acute heart failure syndromes: The EFICA study. Eur J Heart Fail 2006;8:697–705. Lassus J, Gayat E, Mueller C et al. Incremental value of biomarkers to clinical variables for mortality prediction in acutely decompensated heart failure: the Multinational Observational Cohort on Acute Heart Failure (MOCA) study. Int J Cardiol 2013;168:2186–94. Siirilä-Waris K, Lassus J, Melin J, et al. FINN-AKVA Study Group. Characteristics, outcomes, and predictors of 1-year mortality in patients hospitalized for acute heart failure. Eur Heart J 2006 Dec;27(24):3011–7. Crespo-Leiro M, Anker S, Maggioni A, et al. European Society of Cardiology Heart Failure Long-Term Registry (ESC-HF-LT): 1-year follow-up outcomes and differences across regions. Eur J Heart Fail 2016;18:613–25. Parenica J, Spinar J, Vitovec J, et al. Long-term survival following acute heart failure: The Acute Heart Failure Database Main registry (AHEAD Main). Eur J Int Med 2013;24:151–60. Tavazzi L, Senni M, Metra M, et al. Multicenter prospective observational study on acute and chronic heart failure: one- year follow-up results of IN-HF (Italian Network on Heart Failure) outcome registry. Circ Heart Fail 2013;6:473–81. Felker GM, Leimberger JD, Califf RM, et al. Risk stratification after hospitalization for decompensated heart failure. J Card Fail 2004;10:460–6. O’Connor C, Hasselblad V, Mehta RH, et al. Triage after hospitalization with advanced heart failure: the ESCAPE (Evaluation Study of Congestive Heart Failure and Pulmonary Artery Catheterization Effectiveness) risk model and discharge score. J Am Coll Cardiol 2010;55:872–8. Davison BA, Metra M, Senger S, et al. Patient journey after admission for acute heart failure: length of stay, 30-day readmission and 90-day mortality. Eur J Heart Fail 2016;18: 1041–50. Solomon SD, Dobson J, Pocock S, et al. Influence of nonfatal hospitalization for heart failure on subsequent mortality in patients with chronic heart failure. Circulation 2007;116: 1482–7. Khazanie P, Heizer GM, Hasselblad V, et al. Predictors of clinical outcomes in acute decompensated heart failure: Acute Study of Clinical Effectiveness of Nesiritide in Decompensated Heart Failure outcome models. Am Heart J 2015;170:290–7. Cohen-Solal A, Laribi S, Ishihara S, et al. Prognostic markers of acute decompensated heart failure: The emerging roles of cardiac biomarkers and prognostic scores. Arch Cardiovasc Dis 2015:108: 64–74. Konstam MA, Gheorghiade M, Burnett JC, et al. Effects of oral tolvaptan in patients hospitalized for worsening heart failure: The EVEREST Outcome Trial. JAMA 2007;297:1319–31. Hamo CE, Butler J, Gheorghiade M et al. The bumpy road to drug development for acute heart failure. Eur Heart J 2016:18: G19–G32. Ambrosy AP, Cerbin LP, Armstrong PW, et al. Body Weight Change During and After Hospitalization for Acute Heart Failure: Patient Characteristics, Markers of Congestion, and Outcomes: Findings From the ASCEND-HF Trial. JACC Heart Fail 2017;5:1–13. Felker GM, Mentz RJ, Cole RT, et al. Efficacy and safety of tolvaptan in patients hospitalized with acute heart failure. J Am Coll Cardiol 2017;69:1399–1406. Ambrosy AP, Pang PS, Khan S et al. Clinical course and predictive value of congestion during hospitalization in patients admitted for worsening signs and symptoms of heart failure with reduced ejection fraction: findings from the EVEREST trial. Eur Heart J 2013;34:835–43. Chioncel O, Collins SP, Greene SJ, et al. Natriuretic peptide-guided management in heart failure. J Cardiovasc Med 2016;17:556–68. Lassus J, Gayat E, Mueller C, et al. Incremental value of biomarkers to clinical variables for mortality prediction in acutely decompensated heart failure: the Multinational Observational Cohort on Acute Heart Failure (MOCA) study. Int J Cardiol 2013;168:2186–94. Bettencourt P, Azevedo A, Pimenta J, et al. N-terminal-pro-brain natriuretic peptide predicts outcome after hospital discharge in heart failure patients. Circulation 2004;110:2168–74. Salah K, Kok WE, Eurlings LW, et al. A novel discharge risk model for patients hospitalised for acute decompensated heart failure incorporating N-terminal pro-B-type natriuretic peptide levels: a European coLlaboration on Acute decompeNsated Heart Failure: ELAN-HF Score. Heart 2014; 100: 115–25. Dunlay SM, Gheorghiade M, Reid KJ, et al. Critical elements of clinical follow-up after hospital discharge for heart failure: insights from the EVEREST trial. Eur J Heart Fail 2010;12: 367–74. Greene SJ, Maggioni AP, Fonarow GC, et al. Clinical profile and prognostic significance of natriuretic peptide trajectory following hospitalization for worsening chronic heart failure: findings from the ASTRONAUT trial. Eur J Heart Fail 2015; 17: 98–108. Gheorghiade M, Abraham WT, Albert NM, et al. Systolic blood pressure at admission, clinical characteristics, and outcomes in patients hospitalized with acute heart failure. JAMA 2006;296:2217–26. Ambrosy AP, Vaduganathan M, Mentz R, et al. Clinical profile and prognostic value of low systolic blood pressure in patients hospitalized for heart failure with reduced ejection fraction: insights from the Efficacy of Vasopressin Antagonism in Heart Failure: Outcome Study with Tolvaptan (EVEREST) trial. Am Heart J 2013;165:216–25. Reil JC, Custodis F, Swedberg K, et al. Heart rate reduction in cardiovascular disease and therapy. Clin Res Cardiol 2011;100:11–9. Bui AL, Grau-Sepulveda MV, Hernandez AF et al. Admission heart rate and in-hospital outcomes in patients hospitalized for heart failure in sinus rhythm and in atrial fibrillation. Am Heart J 2013;165:567–74.e6. Greene SJ, Vaduganathan M, Wilcox JE, et al. The prognostic significance of heart rate in patients hospitalized for heart failure with reduced ejection fraction in sinus rhythm: insights from the EVEREST (Efficacy of Vasopressin Antagonism in Heart Failure: Outcome Study With Tolvaptan) trial. J Am Coll Cardiol 2013;1:488–96. Cleland JG, Daubert JC, Erdmann E, et al. The effect of cardiac resynchronization on morbidity and mortality in heart failure. N Engl J Med 2005;352:1539–49. Wang NC,Maggioni AP, Konstam MA, et al. Clinical implications of QRS duration in patients hospitalized with worsening heart failure and reduced left ventricular ejection fraction. JAMA 2008;299:2656–66. Chioncel O, Mebazaa A, Harjola VP, et al. Clinical phenotypes and outcome of patients hospitalized for acute heart failure: the ESC Heart Failure Long-Term Registry. European Journal of Heart Failure 2017;19:1242–54. Goldsmith SR, Gheorghiade M. Vasopressin antagonism in heart failure. J Am Coll Cardiol 2005; 46:1785–91. Lee CT, Guo HR, Chen JB. Hyponatremia in the emergency department. Am J Emerg Med 2000; 18:264–8. Gheorghiade M, Abraham WT, Albert NM, et al. OPTIMIZE-HF Investigators and Coordinators. Relationship between admission serum sodium concentration and clinical outcomes in patients hospitalized for heart failure: an analysis from the OPTIMIZE-HF registry. Eur Heart J 2007;28:980–8. Vaduganathan M Marti CN, Mentz RJ, et. al. EVEREST trial investigators. Serum osmolality and postdischarge outcomes after hospitalization for heart failure. Am J Cardiol 2016;117:1144–50. Khan SS, Campia U, Chioncel O, et al. EVEREST Trial Investigators. Changes in serum potassium levels during hospitalization in patients with worsening heart failure and reduced ejection fraction (from the EVEREST trial). Am J Cardiol 2015;115:790–6. Damman K, Valente MA, Voors AA, et al. Renal impairment, worsening renal function, and outcome in patients with heart failure: an updated meta-analysis. Eur Heart J 2014;35:455–69. Larsson A, Akerstedt T, Hansson LO, Axelsson J. Circadian variability of cystatin C, creatinine, and glomerular filtration rate (Gfr) in healthy men during normal sleep and after an acute shift of sleep. Chronobiol Int 2008;25:1047–61. Klein L, Massie BM, Leimberger JD, et al. Admission or changes in renal function during hospitalization for worsening heart failure predict postdischarge survival: results from the Outcomes of a Prospective Trial of Intravenous Milrinone for Exacerbations of Chronic Heart Failure (OPTIME-CHF). Circ Heart Fail 2008;1:25–33. Vaduganathan M, Greene SJ, Ambrosy AP, et al. EVEREST trial investigators. Relation of serum uric acid levels and outcomes among patients hospitalized for worsening heart failure with reduced ejection fraction (from the efficacy of vasopressin antagonism in heart failure outcome study with tolvaptan trial). Am J Cardiol 2014;114:1713–21. Harjola VP, Mullens W, Banaszewski M, et al. Organ dysfunction, injury and failure in acute heart failure: from pathophysiology to diagnosis and management. A review on behalf of the Acute Heart Failure Committee of the Heart Failure Association (HFA) of the European Society of Cardiology (ESC). Eur J Heart Fail 2017;19:821–36. Januzzi J, Filippatos G, Nieminen M, et al. Troponin elevation in patients with heart failure: on behalf of the third Universal Definition of Myocardial Infarction Global Task Force: Heart Failure Section. Eur Heart J 2012;33:2265–71. Felker M, Hasselblad V, Tang W, et al. Troponin I in acute decompensated heart failure: insights from the ASCEND-HF study. Eur J Heart Fail 2012;11:1257–64. Kociol RD, Pang PS, Gheorghiade M, et al. Troponin elevation in heart failure prevalence, mechanisms, and clinical implications. J Am Coll Cardiol 2010;56:1071–8. You JJ, Austin PC, Alter DA, et al. Relation between cardiac troponin I and mortality in acute decompensated heart failure. Am Heart J 2007;153:462–70. Parenti N, Bartolacci S, Carle F, et al. Cardiac troponin I as prognostic marker in heart failure patients discharged from emergency department. Intern Emerg Med 2008;3:43–7. La Vecchia L, Mezzena G, Zanolla L, et al. Cardiac troponin I as diagnostic and prognostic marker in severe heart failure. J Heart Lung Transplant 2000;19:644–52. Wettersten N, Maisel J. Role of cardiac troponin levels in acute heart failure. Cardiac Fail Rev 2015;1:102–6. O’Connor CM, Fiuzat M, Lombardi C, et al. Impact of serial troponin release on outcomes in patients with acute heart failure analysis from the PROTECT pilot study. Circ Heart Fail 2011;4:724–32. Metra M, Cotter G, Davison BA, et al. Effect of serelaxin on cardiac, renal, and hepatic biomarkers in the Relaxin in Acute Heart Failure (RELAX-AHF) development program: correlation with outcomes. J Am Coll Cardiol 2013;61:196–206. Metra M, Cotter G, Gheorghiade M, et al. The role of the kidney in heart failure. Eur Heart J 2012;33:2135–42. Greene SJ, Gheorghiade M, Vaduganathan M, et al. Haemoconcentration, renal function, and post-discharge outcomes among patients hospitalized for heart failure with reduced ejection fraction: insights from the EVEREST trial. Eur J Heart Fail 2013;15:1401–11. Metra M, Davison B, Bettari L, et al. Is worsening renal function an ominous prognostic sign in patients with acute heart failure? The role of congestion and its interaction with renal function. Circ Heart Fail 2012;5:54–62. Voors AA, Dittrich HC, Massie BM, et al. Effects of the adenosine A1 receptor antagonist rolofylline on renal function in patients with acute heart failure and renal dysfunction: results from PROTECT (Placebo-Controlled Randomized Study of the Selective Adenosine A1 Receptor Antagonist Rolofylline for Patients Hospitalized with Acute Decompensated Heart Failure and Volume Overload to Assess Treatment Effect on Congestion and Renal Function). J Am Coll Cardiol 2011;57: 1899–1907. Ambrosy AP, Gheorghiade M, Bubenek S, et al. The predictive value of transaminases at admission in patients hospitalized for heart failure: findings from the RO-AHFS registry. Eur Heart J Acute Cardiovasc Care 2013;2:99–108. Ambrosy AP, Vaduganathan M, Huffman MD, et al. Clinical course and predictive value of liver function tests in patients hospitalized for worsening heart failure with reduced ejection fraction: an analysis of the EVEREST trial. Eur J Heart Fail 2012;14:302–11. van Deursen VM, Damman K, Hillege HL, et al. Abnormal liver function in relation to hemodynamic profile in heart failure patients. J Card Fail 2010;16:84–90. Shinagawa H, Inomata T, Koitabashi T, et al. Prognostic significance of increased serum bilirubin levels coincident with cardiac decompesantion in chronic heart failure. Circ J. 2008;72:364–9. Fonarow GC, Abraham WT, Albert NM, et al. Factors identified as precipitating hospital admissions for heart failure and clinical outcomes: findings from OPTIMIZE-HF. Arch Intern Med 2008;168:847–54. Targher G, Dauriz M, Laroche C, et al. In-hospital and 1-year mortality associated with diabetes in patients with acute heart failure: results from the ESC-HFA Heart Failure Long-Term Registry. Eur J Heart Fail 2017;19:54–65. 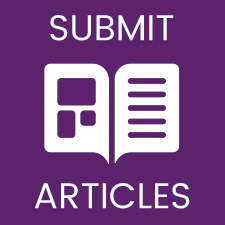 Nathaniel M, Virani HS, Ceconi C, et al. Heart failure and chronic obstructive pulmonary disease: the challenges facing physicians and health services. Eur Heart J 2013;34: 2795–803. De Blois J, Simard S, Atar D, et al. Norwegian Heart Failure Registry COPD predicts mortality in HF: the Norwegian Heart Failure Registry. J Card Fail 2010;16:225–9. Arnaudis B, Lairez O, Escamilla R, et al. Impact of chronic obstructive pulmonary disease severity on symptoms and prognosis in patients with systolic heart failure. Clin Res Cardiol 2012;101:717–26. Mentz RJ, Greene SJ1, Ambrosy AP, et al. Clinical profile and prognostic value of anemia at the time of admission and discharge among patients hospitalized for heart failure with reduced ejection fraction: findings from the EVEREST trial. Circ Heart Fail 2014;7:401–8. Swedberg K, Young JB, Anand IS, et al. Treatment of anemia with darbepoetin alfa in systolic heart failure. N Engl J Med 2013;368:1210–9. Altman DC, Vergouwe Y, Royston P, et al. Prognosis and prognostic research: validating a prognostic model. BMJ 2009;338:b605. Giamouzis G, Kalogeropoulos A, Georgiopoulou V, et al. Hospitalization epidemic in patients with heart failure: risk factors, risk prediction, knowledge gaps, and future directions. J Card Fail 2011;17:54–75. Moons KGM, Altman DG, Vergouwe Y, et al. Prognosis and prognostic research: application and impact of prognostic models in clinical practice. BMJ 2009;338:b606. Passantino A, Monitillo F, Iacoviello M, et al. Predicting mortality in patients with acute heart failure: Role of risk scores. World J Cardiol 2015 26;7:902–11.